Last Tuesday, I spend the afternoon photographing the Abu Dhabi Air Expo. Officially called the only General Aviation event in the Middle East, it feels very similar to events like MEBA (Middle East Business Aviation) in Dubai. Even though there were a few light aircraft on display, the majority of the exhibitors were directly connected to "Business Aviation". Even though this was not an airshow, the UAE National Jet team - Al Fursan, performed during the late afternoon. Not wanting to duplicate what I wrote earlier about this relatively new team flying the Italian MB339, I invite you to first read the 2013 Pic(k) of the week 49 post. As part of the colours of the UAE flag, they are the only jet team in the world displaying black smoke. 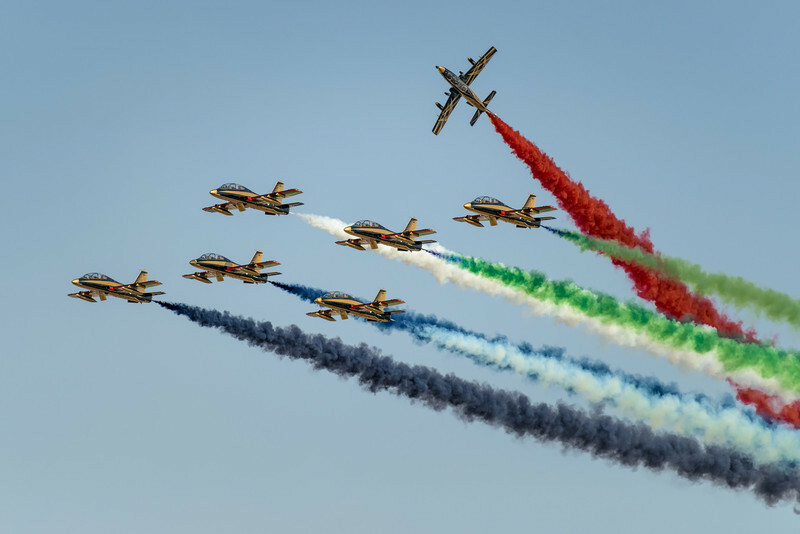 The image below was made during one of the highlights of the Al Fursan display; the solo display barrel rolls his jet around the 6 other members of the team. More images of the Aviation Expo in Abu Dhabi can be found here. Back from a great ski-trip to the worlds largest ski area; Les Trois Val ées (France), it did little photography but did manage to shoot a reasonable amount of GoPro video footage while skiing. An interesting action packed 1 min movie trailer can be found here. One of the three valleys (Trois Vallées) in the 600km ski-area holds an airport, a very special one! The 525m runway at Courchevel Altiport sits on the side of a mountain and has an 18.5% slope. Because of the sloping terrain and its elevation of over 6500 feet, it is a one way in, one way out runway. Obviously landing upslope and taking-off downhill! Just like all "Altiports" (mountain airports in France), special training is needed before being allowed to operate at Courchevel. Something that is on my flying bucket-list ! The image below was taken with my iPhone 4S, using the built in panorama function. It was physically made from the ski-slope just next to the runway. One can actually see my skis on the left! Remember; " The best camera is the one you have with you!" Photographing the world largest airliner from an interesting perspective, has been a challenge for most Aviation photographers. Since I started flying the Airbus A380 more than a year ago, I've been on the lookout to find some interesting angles to photograph the big mama. One of them I've been wanting to try is shooting from a low angle, where it appears the aircraft is airborne even though the engines are clearly shut down. Having a clear, relatively flat horizon in an airport environment is often the biggest problem! Finally things have come together and I'm pretty happy with the result of the image below. The black and white conversion seems to simplify the shot even more! I believe the image deserves a place in my limited Aviation Portfolio. More Airline photography can be found here. 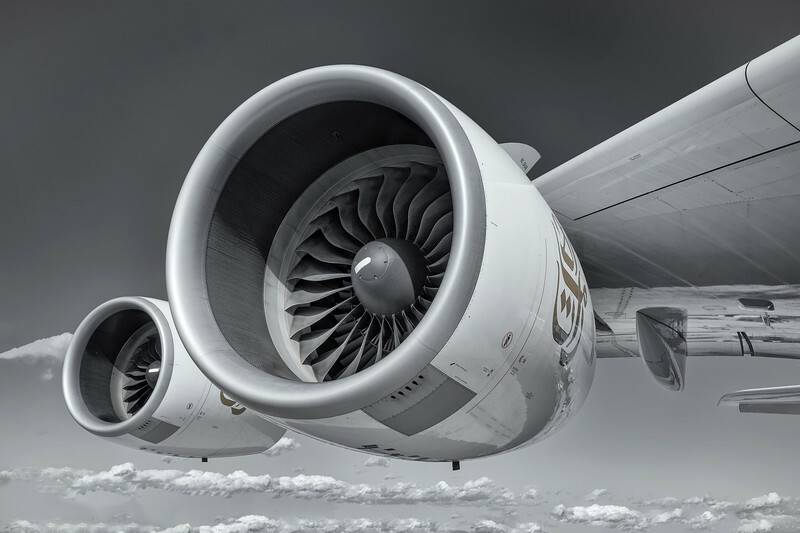 For those of you interested, the 4 engines on the A380 develop more than 280.000 pounds of thrust. It had been more than 15 years, since I last was in my favourite European city... Even though I used to spend quite a bit of time in Barcelona, the capital of Catalonia in the nineties, I kind of forgotten why I got to love this place so much! The number one reason is without doubt is the Architecture; it is a mecca for every Architectural photographer. Particularly renown are the architectural works of Spanish Architect Antoni Gaudi. But it was the 1992 Olympic Games in Barcelona that really gave the city its facelift. 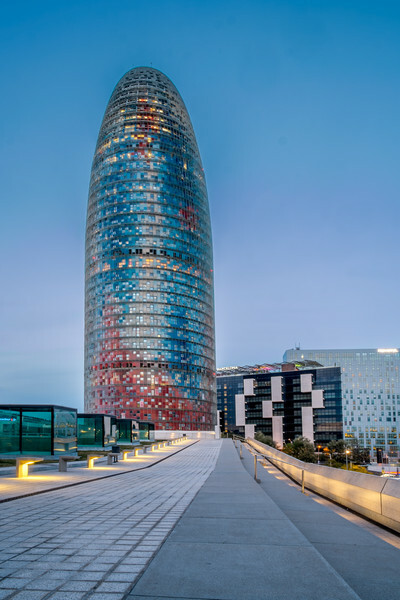 The newest and still the tallest sight of Barcelona is the Torre Agbar; a 32 floor (142m) office building designed by French Architect Jean Nouvel which was finished in 2005. The word "Agbar"is made up of the Castillian, Aguas de Barcelona, the municipality water provider which belongs to the Groupo Agbar which owns the building. The image below was made during the blue hour (just after sunset). Unfortunately, I wasn't there during the weekend, when the building is lit up during nighttime; Winter 2000-2300, Summer 2100-0000. The Fujifilm X-series cameras keep on surprising me. Never thought, I would use it for Architectural work and now I can't see a reason why not! Hoping to test the 10-24 lens soon. More images of Barcelona, can be found in the brand-new gallery here.